Mr. Ferruggio, the in-flight director, was credited with saving about 170 lives in 1970. About 16 hours into a hijacking that made world news in September 1970, in-flight director John Ferruggio knew he would have little time to evacuate the passengers on Pan American World Airways Flight 93 once the jet landed. Two hijackers armed with handguns and grenades had taken control of the 747 jumbo jet, which was supposed to fly from Amsterdam to New York City. They diverted it to Beirut, where a third hijacker boarded with dynamite. Then, the plane headed to Egypt. Passengers slid quickly down the escape slides, and the last of the crew followed, barely getting past the tips of the wings when the jet exploded. Mr. Ferruggio, who was credited with saving about 170 lives by directing the orderly evacuation, died Saturday in Milton Hospital of organ failure, shortly after undergoing medical tests. He was 84 and had lived in Milton. 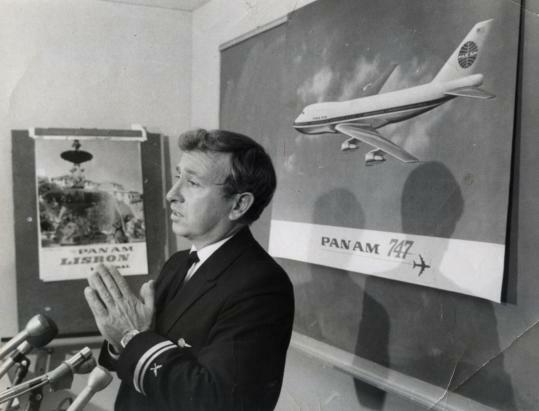 Mr. Ferruggio had been with Pan Am for 16 years on Labor Day weekend 1970 and knew that in the age of hijackings, when several planes had been taken to Cuba, he might someday find himself facing passengers holding weapons. The Boeing 747 he was assigned to was the fourth New York-bound jet hijacked on Sept. 6, 1970, by the Popular Front for the Liberation of Palestine. The coordinated effort by the organization, which opposed US policy in the Middle East, turned the day’s events into international news. The first two hijackers who boarded Mr. Ferruggio’s flight had been kicked off another plane, and the Pan Am pilot did not find their weapons when he patted them down before departing. When the hijackers took control, Mr. Ferruggio said, the more than 150 passengers stayed remarkably calm. Mr. Ferruggio asked the hijackers what would happen, and they responded that the jet would explode eight minutes after it landed in Cairo. After telling the crew, he explained the urgency of the situation to the passengers. Once the passengers and cabin crew were out, he, too, slid down the exit slide. Everyone had escaped in less than a minute and a half. “It was the fastest I’ve ever seen it done and the fastest I’ve ever heard of,’’ he said at the 1970 news conference. John Joseph Ferruggio was born in Boston’s North End, the youngest of three children. His parents were immigrants from Sicily and moved to South Boston, where he started school at an early age to add another child fluent in English to the household, his daughter said. As a result, he was younger than others in his South Boston High School graduating class. World War II had started, and Mr. Ferruggio forged his father’s signature to join the US Navy. Aspiring at the time to become a doctor, he trained as a pharmacist and was assigned to a Marine unit, taking part in battles at Guadalcanal and Iwo Jima. After the war, he returned to South Boston, where he worked in shipyards and opened a couple of small restaurants before taking a job with Pan Am. In 1961, he married Susan Wilson, to whom he was introduced by mutual friends. She had grown up in Newton and was a ballet dancer in New York City, where they became a couple before marrying and moving to South Boston. She ran a dance studio in Boston, and Mr. Ferruggio, through his work, met a stream of dignitaries and celebrities who flew international flights. The family moved to Milton in the early 1970s, and Mr. Ferruggio retired from Pan Am about a dozen years later. He ran a real estate office in South Boston and in recent years was a full-time caregiver for his sister, Josephine of Milton. Still, he didn’t mind stepping into the spotlight himself, and he was an enthusiastic participant during karaoke nights at local establishments. In addition to his wife, daughter, and sister, Mr. Ferruggio leaves two other daughters, Lisa DeLuca of Milton and Donna Lee York of North Andover; and six grandchildren. A memorial service will be held at 10 a.m. tomorrow in Dolan Funeral Home in Milton. Burial will be in Blue Hill Cemetery in Braintree.